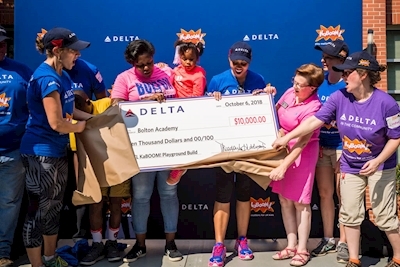 More than 250 volunteers from Delta and parents, teachers and staff from Atlanta Public School (APS) Bolton Academy, as well as local community members, came together in record-breaking heat on October 6 to build Delta's 26th KaBOOM! playground as part of "Hands On Atlanta Day". This was the fifth Delta-KaBOOM! 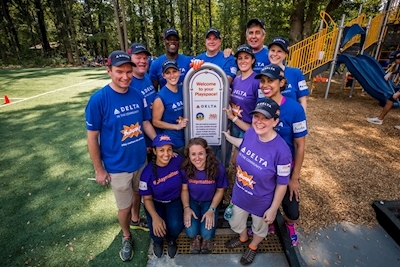 playground built in Atlanta since the partnership began in 2013. The new 2,500 square foot playground will offer a safe and accessible place to play for nearly 600 students at Bolton Academy. In addition, the playground will be accessible to kids in the local west Atlanta community, which will impact thousands of kids for years to come. "As children you need to have a balance of work and play, just as we do as adults, and it is important to have a safe place to play," said Bolton Academy Principal Anita Lawrence. "We have a large student community who utilize this space every day, so it's important to make it interactive and engaging and more importantly, something they wanted and helped design." Bolton Academy students were engaged from the initial planning of the project, tasked with drawing designs for their ideal playground at a Design Day held in August. The new playground is exclusively designed from the students' drawings and in addition to assembling and installing the brightly colored playground, volunteers also completed side projects, which included painting outdoor games and activities, creating an outdoor classroom, and building an outdoor stage, as well as gardening and landscaping. The day kicked off with comments from APS Superintendent Dr. Meria Carstarphen who said, "We know that play, especially in the early years, is essential for a healthy body, but also a healthy mind. Delta has always been building and helping at APS, and Delta is a giant in the minds of Atlantans, because they are headquartered here, and they're doing things that are game-changing." The crowd of Delta and community volunteers also heard from APS Board Chair Jason Esteves, who lives near the school, Hands on Atlanta CEO Jay Cranman and Atlanta City Council member Matt Westmoreland. All of the speakers touched on the impact the playground would have for years to come in the growing west side neighborhood and thanked Delta and the volunteers for their commitment to giving back to the community. After six hours the playground was complete, and at the Ribbon Cutting Delta surprised Bolton Academy with a check for $10,000, which will assist the school with long-term maintenance of the playground and support the programs the school provides students. Representatives from Delta, Bolton Academy and the local community cut the ribbon to dedicate the new playground including Michael Julian Bond, representing Atlanta City Council. KaBOOM! is the national non-profit dedicated to giving all kids – particularly those growing up in poverty in America – the childhood they deserve filled with balanced and active play, so they can thrive. This was the last KaBOOM! build of 2018, and Delta employees have helped build playgrounds in Los Angeles, Miami, New York , Salt Lake City, and Washington, DC, this year.